A member of a star-studded class that would ultimately produce fifty-nine generals, including Omar Bradley, Eisenhower was a solid student and graduated 61st in a class of 164. While at the academy, he also proved a gifted athlete until having his career cut short by a knee injury. Completing his education, Eisenhower graduated in 1915 and was assigned to the infantry. Eisenhower was one of a select few who obtained the rank of a 5 star general on December 20, 1944. In his early Army career, he excelled in staff assignments, serving under Generals John J. "Black Jack" Pershing, Douglas MacArthur, and Walter Krueger. Known as an excellent staff officer, Eisenhower was selected as aide by US Army Chief of Staff General Douglas MacArthur. When MacArthur's term ended in 1935, Eisenhower followed his superior to the Philippines to serve as a military advisor to the Filipino government. Promoted to lieutenant colonel in 1936, Eisenhower began to clash with MacArthur on military and philosophical topics. Opening a rift that would last the remainder of their lives, the arguments led Eisenhower to return to Washington in 1939 and take series of staff positions. In June 1941, he became chief of staff to 3rd Army commander Lieutenant General Walter Krueger and was promoted to brigadier general that September. With the US entry into World War II after the attack on Pearl Harbor, Eisenhower was assigned to the General Staff in Washington where he devised war plans for defeating Germany and Japan. Becoming Chief of the War Plans Division, he was soon elevated to Assistant Chief of Staff overseeing the Operations Division under Chief of Staff General George C. Marshall. Though he had never led large formations in the field, Eisenhower soon impressed Marshall with his organizational and leadership skills. As a result, Marshall appointed him commander of the European Theater of Operations (ETOUSA) on June 24, 1942. This was soon followed by a promotion to lieutenant general. After extensive planning, Eisenhower moved forward with the invasion of Normandy (Operation Overlord) on June 6, 1944. Successful, his forces broke out of the beachhead in July and began driving across France. Though he clashed with Churchill over strategy, such as the British-opposed Operation Dragoon landings in Southern France, Eisenhower worked to balance Allied initiatives and approved Montgomery's Operation Market-Garden in September. Pushing east in December, Eisenhower's biggest crisis of the campaign came with the opening of the Battle of the Bulge on December 16. With German forces breaking through the Allied lines, Eisenhower quickly worked to seal the breach and contain the enemy advance. Over the next month, Allied troops halted the enemy and drove them back to their original lines with heavy losses. 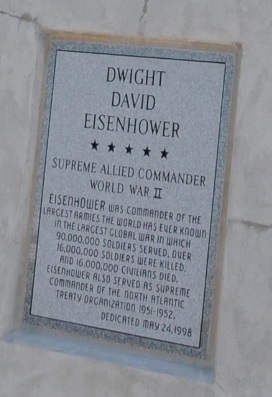 During the fighting, Eisenhower was promoted to General of the Army. With the surrender of Germany on May 8, 1945, Eisenhower was named Military Governor of the US Occupation Zone. As governor, he worked to document Nazi atrocities, deal with food shortages, and aid refugees. Returning to the United States that fall, Eisenhower was greeted as a hero. Made Chief of Staff on November 19, he replaced Marshall and remained in this post until February 6, 1948. A key responsibility during his tenure was overseeing the rapid downsizing of the army after the war. Departing in 1948, Eisenhower became President of Columbia University. While there, he worked to expand his political and economic knowledge, as well as wrote his memoir Crusade in Europe. In 1950, Eisenhower was recalled to be the Supreme Commander for the North Atlantic Treaty Organization. Serving until May 31, 1952, he retired from active duty and returned to Columbia. Entering politics, Eisenhower ran for president that fall with Richard Nixon as his running mate. Winning in a landslide, he defeated Adlai Stevenson. A moderate Republican, Eisenhower's eight years in the White House were marked by the end of the Korean War, efforts to contain Communism, construction of the instate highway system, nuclear deterrence, founding of NASA, and economic prosperity. Leaving office in 1961, Eisenhower retired to his farm in Gettysburg, PA. He lived in Gettysburg with his wife, Mamie (m.1916) until his death from heart failure on March 28, 1969. Following funeral services in Washington, Eisenhower was buried in Abilene, KS at the Eisenhower Presidential Library. Dwight David "Ike" Eisenhower October 14, 1890 – March 28, 1969) was the 34th President of the United States from 1953 until 1961. He was a five-star general in the United States Army during World War II and served as Supreme Commander of the Allied Forces in Europe; he had responsibility for planning and supervising the invasion of North Africa in Operation Torch in 1942–43 and the successful invasion of France and Germany in 1944–45 from the Western Front. In 1951, he became the first supreme commander of NATO. Eisenhower entered the 1952 presidential race as a Republican to counter the non-interventionism of Senator Robert A. Taft and to crusade against "Communism, Korea and corruption". He won by a landslide, defeating Democrat Adlai Stevenson and ending two decades of the New Deal Coalition. In the first year of his presidency, Eisenhower deposed the leader of Iran in the 1953 Iranian coup d'état and used nuclear threats to conclude the Korean War with China. His New Look policy of nuclear deterrence gave priority to inexpensive nuclear weapons while reducing the funding for conventional military forces; the goal was to keep pressure on the Soviet Union and reduce federal deficits. In 1954, Eisenhower first articulated the domino theory in his description of the threat presented by the spread of communism. The Congress agreed to his request in 1955 for the Formosa Resolution, which enabled him to prevent Chinese communist aggression against Chinese nationalists and established the U.S. policy of defending Taiwan. When the Soviets launched Sputnik in 1957, he had to play catch-up in the space race. Eisenhower forced Israel, the UK, and France to end their invasion of Egypt during the Suez Crisis of 1956. In 1958, he sent 15,000 U.S. troops to Lebanon to prevent the pro-Western government from falling to a Nasser-inspired revolution. Near the end of his term, his efforts to set up a summit meeting with the Soviets collapsed because of the U-2 incident. 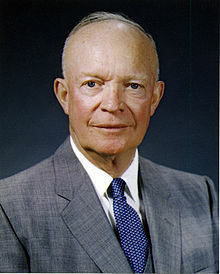 In his 1961 farewell address to the nation, Eisenhower expressed his concerns about future dangers of massive military spending, especially deficit spending, and coined the term "military–industrial complex".